Ah, Australia: exotic wildlife, friendly greetings of “G’day!” or “How ya goin’?”, summer in December, flies. 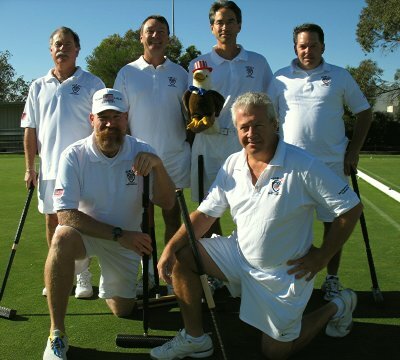 The United States croquet team encountered all this and more when they travelled “Down Under” for the 2006 MacRobertson Shield. The six-player team, four of whom hail from NC, placed third in the four-country competition. While Team USA were disappointed with their performance in the first two tests, against Australia and Great Britain, they pulled together in the final test against New Zealand. Widely considered underdogs, Team USA beat the Kiwis 13-8. After falling behind 1-2 on the first day’s doubles, the Americans posted a clean sweep of the day 2 singles matches to take a commanding 7-2 lead. On day 4 they had another good day in singles, winning four of six matches and closing out the test. MacRobertson Shield rookie Danny Huneycutt (Lexington, NC) had the honor of scoring the decisive eleventh win.